‘PINTER’ is writ large across the stage, projected onto a mottled grey background; there is little ambiguity in the purpose of ‘Pinter at the Pinter’ at the Harold Pinter Theatre. 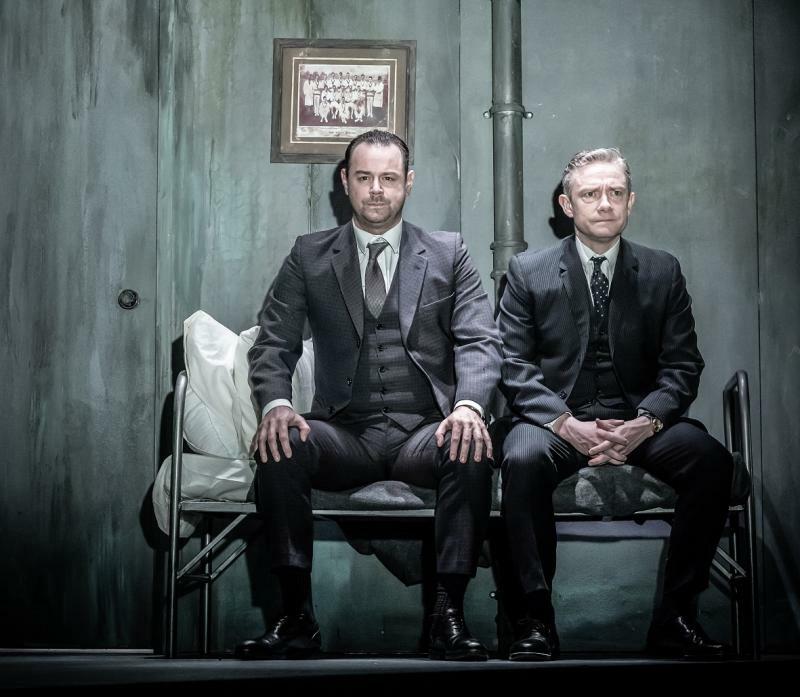 Indeed the advertising for Pinter Seven is equally forthright on the main selling point: the novelty combination of Martin Freeman and Danny Dyer on stage. Dyer, recently revealed to be related to a saint, is an interesting choice, more well known for his portrayal of geezers than stage work. I was surprised to learn that he did in fact know Pinter, through working on Celebration at The Almeida in 1999 – more than that, Dyer describes Pinter as his “mentor”. In equal parts intrigued and bemused, I looked forward to an evening with the pair of them acting in The Dumb Waiter. The Dumb Waiter has been described as one of Pinter’s most claustrophobic plays, one of his most accomplished pieces. And it is funny, properly hilarious at times, as two hitmen wait for their orders in a spartan basement – Ben (Dyer) relaxed, Gus (Freeman) on edge. The scene is dramatically interrupted by a succession of food orders sent down in a dumb waiter – though there is some doubt over whether this, or one of the two hitmen is the eponymous idiot – which provides a rich vein of humour climaxing in Freeman screaming “Scampi!” to a doubled-over audience. But it didn’t feel interesting or new. The duo of nervous, energetic Ben – employing a familiar Fargo-esque bag of tricks – and a stilted, pantomime Gus does kind of work but you can’t help but suspect that this was not an active choice. There were a couple of really strong theatrical moments and subtle touches. The pair, fully dressed and prepared (looking more like waiters than hitmen) repeat their previous discussions over and over devoid of detail or real connection, highlighting the repetitive movements they had acted out earlier. Like some of Pinter’s best work this does drive at the crux of human relationships, two men who spend so much time together but never really speak. The highlight of the evening, however, was not the touted celebrity two-hander but the tragicomic A Slight Ache. Unlike The Dumb Waiter, there is a sense that this play deserves to be produced beyond the ambition of just staging all of Pinter’s one-act plays in one season. 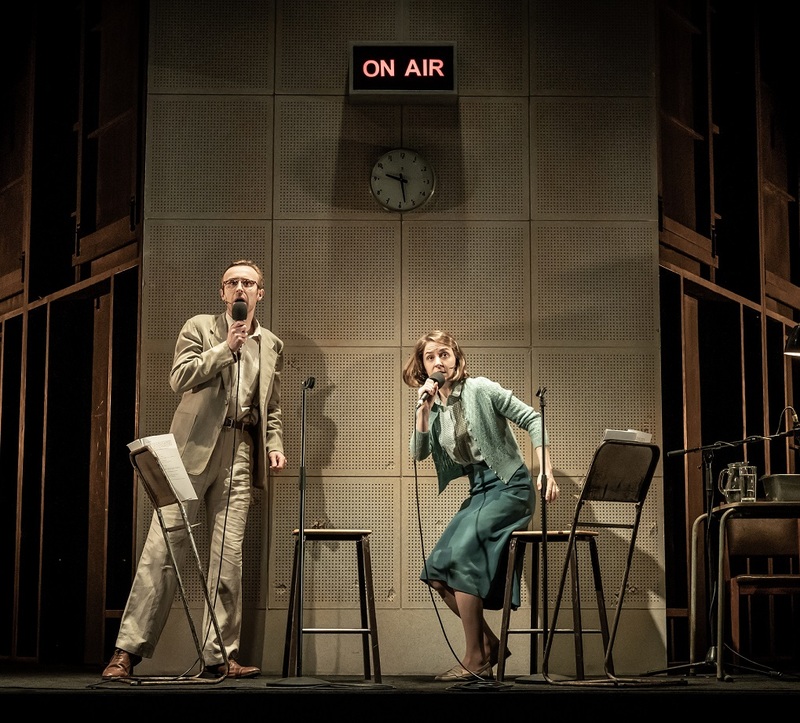 Originally a radio play in which Flora (Gemma Whelan) and Edward’s (John Heffernan) dyed-in-the-wool Conservative country existence is interrupted by the presence of a match-seller who never speaks, Jamie Lloyd chooses to present the piece on stage. We open in a radio studio, an ‘ON AIR’ sign flashes red and we’re off. The genius of the piece is its ability to toy with form from this point onwards as the actors become steadily more physically engaged with the story. The actors carry their microphones with them, tied to the inexorable nature of the narrative as the play moves from lightly humorous to the (sometimes melodramatic) undoing of its central players. It is a testament to incredible storytelling that despite the set being so detailed and clearly a studio, I am fully absorbed in the couple’s country home from the first minute. With clever (and entertaining) creations of sound for radio, this interpretation is not restricted by its central conceit; exploiting the ‘performance’ to add real tension between the two actors and the play itself: who is in control? This was an excellent piece of work which really justified its performance. Bringing to life Pinter’s radio play on stage was exciting, riveting and added new nuance – the real star of the evening.